Two of my good friends got married on September 10, 2011 at Sucrerie de la Montagne in Quebec, Canada. On a side note, Chef Anthony Bourdain went to this very sugar shack for his television show, No Reservations. My friends had an intimate wedding and invited their friends and family to bring cakes for dessert. So I took this opportunity to make my first wedding cake. It was a one-tier, two-layer chocolate cake with strawberry raspberry jam and vanilla Swiss meringue buttercream. 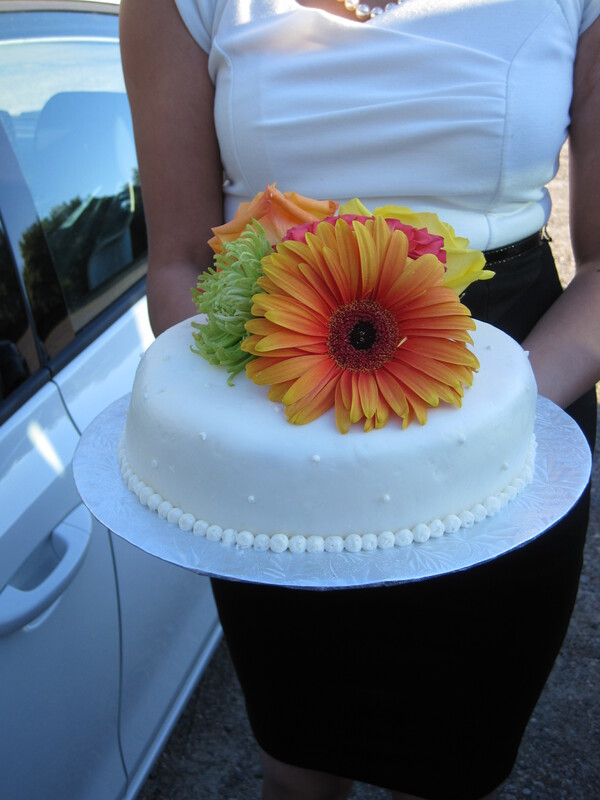 It was covered with marshmallow fondant and topped with fresh, fall coloured flowers. I was very happy with how it turned out and people loved the way that it tasted. My cake decorating skills have come a LONG way since my Michael’s cake decorating course. 🙂 This cake was surprisingly easy to make. See below for the recipes and a few tips. For the cake, I used this chocolate cake recipe. 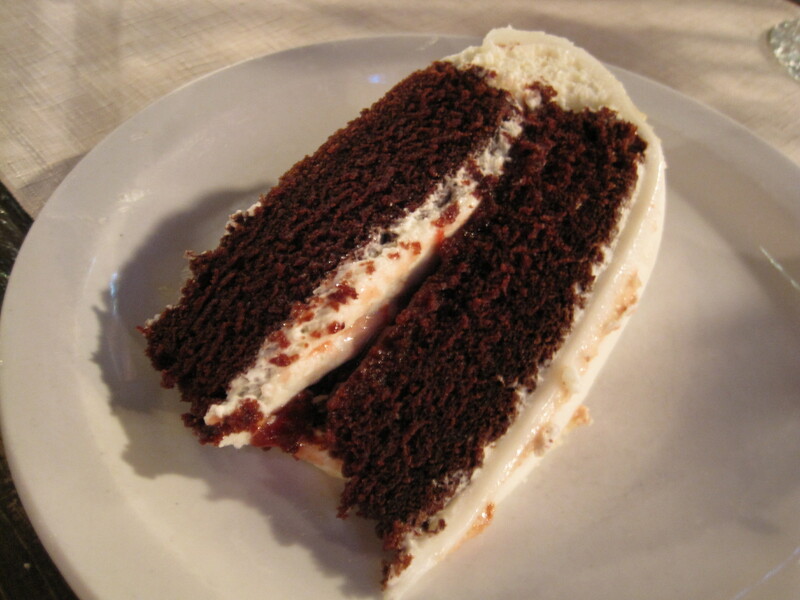 It was moist and chocolatey, and it held together beautifully for perfect, thin slices of cake. I recommend making the cake layers in advance. Once the cake layers have completely cooled, wrap them individually in a layer of plastic syran wrap, followed by a layer of aluminum foil, and then place them into freezer bags, squeezing out all of the air from the bag. Set these on top of pieces of cardboard and freeze them. The night before you are ready to assemble your cake, defrost the cake layers in the refrigerator. Before you start to decorate your cake, use a sharp knife (I like to use a bread knife) to cut off the domed part of each layer of cake. Measure your cake at several different points before cutting so that you don’t end up with a slanted cake. You can taste test your cake by eating the bits that you remove. For the frosting, I made vanilla swiss meringue buttercream. I recommend making the frosting ahead of time as well. This can be frozen and must be defrosted overnight at room temperature prior to use. When you are ready to decorate your cake, spread some of the frosting on to the middle of the cake board. This will help hold your cake in place. Then set the bottom layer of cake, cut side up, onto the cake board. Spread a 1/4 to 1/2 inch thick layer of frosting on top of the bottom layer. Spread a thin layer of jam on top of the frosting, but leave a jam-free 1/4 inch border along the edge of the cake. This will prevent the jam from spilling out when you add the top layer of cake. Add the top layer of cake, cut side down this time. Cover the top and sides of the cake with 1/4 inch thick layer of frosting. For the fondant, I made marshmallow fondant using this recipe. The fondant needs to be made ahead of time as it needs to rest for at least 8 hours prior to use. It can be made weeks in advance and stored in the refrigerator. Use the fondant to cover the cake as per the instructions in this post. Finish decorating the cake. I used the vanilla swiss meringue buttercream to pipe a border and minor details onto the fondant covered cake. Alternatively, you could wrap a pretty ribbon along the border of the cake. I then topped it with an arrangement of fresh flowers. You could use fondant, gumpaste, buttercream or royal icing flowers instead. Do not refrigerate the cake once it has been covered with fondant. Keep it at room temperature in a box until ready to serve. Sucrerie de la Montagne is a sugar shack in Quebec, Canada. Each wall of the lovely log cabin is adorned with fantastic antiques, tools, and photos. It does not appear cluttered as it is obvious that each cherished item was carefully selected and tastefully placed. The atmosphere is homely, warm, and absolutely charming. My favourite thing about the decor is that each room houses an antique oven. The food was served family style and the service was excellent. Their homemade, wood-oven baked bread was beautifully soft and warm. But best of all, each of the tables was provided with a bottle of their maple syrup and their fantastic homemade pickles, tomato relish, and pickled beets. To start we had pea soup and a simple salad with maple syrup dressing. Everyone loved the salad dressing. For the main course, we had maple glazed chicken, mashed potatoes, roasted cauliflower and zucchini. 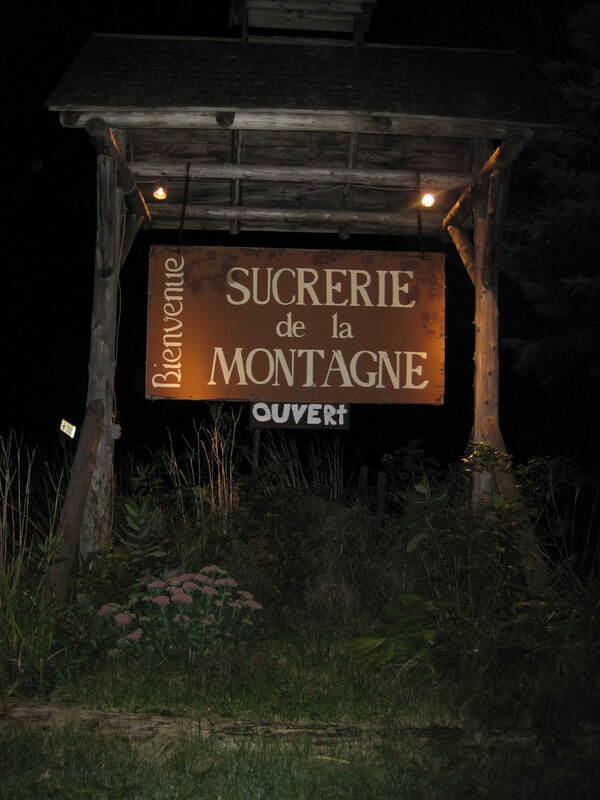 I would love to go back to the Sucrerie de la Montagne to try their traditional Quebec meal (reservations required). This was such an amazing cake. It was delicious, cut perfectly, and just looked amazing. I’d recommend this to anyone! Hi Alison, love your website! My fiance and I are currently looking at having our ceremony/reception at the sucrerie de la montagne 🙂 Would you have any feedback to give us? 1. venue – I loved the actual log cabin and all of the vintage decorations. The actual room was beautiful with open beams and lovely lovely decorations and lights. But a note to your photographer, the lighting was difficult to work with for photos. I felt that the grounds were very au naturale and poorly lit in the evening. I imagine it would be an amazing venue for a winter event, although it would probably be problematic for your guests to walk into from the parking lot. 2. food – I was absolutely in love with their maple salad dressing and their homemade relishes. I also loved that they had a bottle of maple syrup on the table (I poured it over the chicken). The chicken and sides were standard, but it was a nice meal. It is served family style and only one plate/bowl of each item was brought to each table. Depending on your guests self-helpings, sometimes there wasn’t enough food to make it to the end of the long tables. However, it is all you can eat, so your guests simply have to ask for more. Unfortunately, not all of the guests knew this, and some went home hungry. 3. service – The staff were excellent, friendly, and were dressed in vintage costume. They were also extremely accommodating to the bride and groom who had asked that they set the tables up in a way that allowed a large play area for kids. They also made arrangements for bedding for the kids to sleep on while the adults sat by a bon fire outside. 4. their overnight accommodations – from what I heard from the bride and groom, one night in one of their log cabins was included in their wedding costs and it was comfortable, but a very basic cabin.